Good grooming comes naturally to most cats. They diligently lick their fur multiple times per day, ensuring that their coats look sleek and healthy no matter what the season. When your normally well-groomed pet suddenly looks greasy and disheveled, it's only normal to be concerned. Although most short-term changes in grooming aren't serious, over- or under-grooming can be a sign of a health problem. 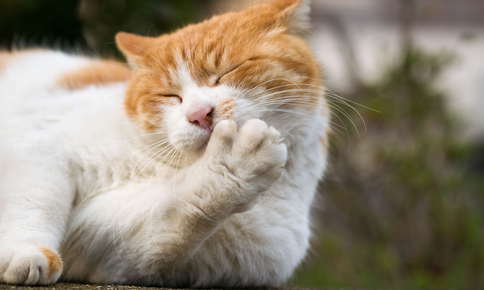 Why Do Cats Groom Themselves? Grooming removes loose hair and distributes natural oils along the coat, but it also offers several other benefits. Have you ever noticed that your cat spends more time grooming on hot, humid summer days? Grooming offers a natural cooling effect that can help your feline feel more comfortable when the temperature soars. Grooming also helps cats get rid of irritating substances and invaders, such as allergens and insects that may have hitched a ride on your pet's body. Many cats find grooming soothing and will settle down for a long licking session if they feel a little anxious. Why is Over-Grooming a Problem? Although it might seem as if your cat could never be too clean, over-grooming isn't good for your pet's skin. Excessive grooming can lead to hair loss and bald patches on the skin. If your pet's rough tongue breaks the surface of the skin, infected sores may form. Creepy, Crawly Bugs. If your cat has fleas or other parasites, he or she will try to get rid of the irritating pests by licking them away. Itching. Frequent grooming may be your pet's way of handling itchy skin, due to allergies or parasites. Pain. In your cat's mind, grooming is a natural pain reliever. If your pet has developed arthritis or another painful condition, he or she may spend more time than usual licking one particular area. Stress. Has your pet's normal routine changed lately? Any change can cause stress and anxiety, such as the addition of a new person or pet, a move to a new home or the death of a family member or pet. Feline Hyperesthesia Syndrome (FHS). The skin becomes extremely sensitive in cats who have FHS. The syndrome can be caused by allergies, fleas, ringworm, neurological conditions that affect the spine or tail, or compulsive behavior. If your cat has FHS, he or she may frantically lick or bite the skin in an attempt to calm the uncomfortable sensations. Why Do Some Cats Stop Grooming? Arthritis. Painful joints make it difficult to reach all areas of the body easily. Illness. Grooming may require too much energy if your pet doesn't feel well. Obesity. Packing on a few pounds isn't just bad for your pet's health, but can also make grooming harder. Dementia. Older pets who have dementia may simply forget to clean themselves. Mouth Pain. Your cat may have stopped grooming due to a dental issue or even a tumor in the mouth. Anxiety. Although stress and anxiety can cause excessive grooming, some cats react to stressors by avoiding grooming. Why Can I Do to Help My Cat? It's a good idea to schedule a visit with your pet's veterinarian if grooming changes last more than a few days. If the visit reveals a health issue, your pet will receive the appropriate treatment for his or her condition, such as flea or allergy medications, special shampoos that soothe the skin and reduce allergens, or dental treatment. When grooming issues are caused by weight gain, your pet's vet can provide information on weight loss and recommend foods that will help your cat stay slim. Older pets who have arthritis or dementia may need a little help with grooming. Daily brushing will help your cat's coat look its best and also give you the perfect opportunity to spend a little quality time with your favorite feline. Anxious pets may benefit from natural pheromones or even prescription anti-anxiety medication in severe cases. Maintaining a consistent routine and spending more time than usual with your pet can help him or her feel more secure and relaxed. Are you concerned about your cat's grooming habits? We can help. Call us to schedule a convenient appointment for your furry friend. "Great staff. My cat feels very comfortable going there! Thank you for taking care of him!" "Great staff! I know my dog is in good hands when I bring her in." "Even though I moved out of state I still plan on bringing all 3 dogs back here for their dental work and care! Tony and his staff have always been impeccable and knowledgeable in all their work with my animals!"